One of the first things I learned about working with the Second Life viewer’s codebase is that the build environment is very particular. Once I found out that Linden themselves use Debian to build their Linux binaries, I figured that was probably the best approach for me to take. Instead of firing up VirtualBox & deploying a new Debian VM, I discovered a wonderful tool call debootstrap which “which will install a Debian base system into a subdirectory of another, already installed system” & allows me to build a 32-bit viewer using 32-bit Debian on my 64-bit Arch Linux work machine. I recently set up the same arrangement on my home machine & thought I would document it, both as a reference for myself & to others who may be in a similar situation. First install debootstrap from the AUR using your preferred AUR helper. Then create a directory for the Debian system to be installed into. Obviously you can substitute i386 for other architectures, squeeze for other Debian releases & the mirror to one geographically closer to you. To use the Debian install we chroot into it, using linux32 to report the correct architecture. I wanted the Debian chroot to be able to access files on the host system (namely the viewer code itself) so what I did next was create a user in the chroot with the same name as my user on the host machine. Note that the prompt has changed now that we’re chroot’ed into Debian. And made a mountpoint in the Debian directory tree for the host machines RAID. Then the following bash script added to /etc/rc.d/ provides a way to conveniently mount/unmount /dev, /dev/pts, /dev/shm, /tmp, /home & the RAID from the host machine into the debian chroot. Update – should you ever decide to delete the debootstrap, don’t forget if you have mounted parts of the host filesystem within it (as I very nearly discovered the hard way!). This can be added to the daemons array in /etc/rc.conf as usual & manually invoked in the usual manner. Install the dependencies (including ccache to speed up subsequent compilations of the viewer) listed by the Second Life wiki for building the viewer on Linux. Update – you may also need to install libxml2 which isn’t listed by the wiki, if the build fails saying it can’t find lxml2. The easiest way to use ccache is to allow it to ‘masquerade’ as the other compiler commands, so that when you call (for example) gcc it actually calls the ccache version. To do this, you just need to export the ccache bin directory to the beginning of your path. The path is different for Arch & Debian so be careful if you add the export to your .bashrc so that it works every time you login. Now when you do which on gcc or g++ it should return the ccache versions. Note that the default location that ccache uses to store the actual cache is ~/.ccache which you might want to change (eg to a SSD to increase speed, or away from a SSD to reduce wear). IIRC the default maximum size for the cache is 1GB. You can check the status of the cache via the -s flag. The viewer is built with autobuild so grab that as per the wiki’s instructions. And add it to your path, which I’ve done in my .bashrc. With any luck we can now use our Debian chroot to actually build the viewer using autobuild. I made myself a little bash script to automate the process & to cancel the build if it detects that it isn’t being run in the Debian chroot. echo "Done building, have a nice day." echo "Not running in 32-bit debootstrap, exiting." I like to make it really obvious when I’m in a chroot so I don’t inadvertently perform some sort of destructive maintenance on what I think is a chroot, only to discover that it is actually the host system & I have to go scrambling for the backups. A simple solution I thought of is simply to create a file in the root of the chroot & check for its existence at / in .bashrc. This check also allows me to use the right path for the export for ccache. This goes in the .bashrc of my regular user on the host system (because that is mounted to the chroot’s /home) but in the .bashrc of the chroot’s /root user (as the host system’s /root isn’t mounted into the chroot). The result is that the text ‘CHROOTdebootstrap32’ is appended in bright red to the prompt when in the chroot. I thought that I would quickly add an option to the menu bar in my Second Life client to pop up a dialog (a window) to display the data streaming in over the serial port & maybe some options to enable/disable controls & whatnot. Unfortunately the page on the wiki for how to add dialogs hasn’t been updated since 2008 & the code/instructions no longer work, so I had to explore the viewer source to see how dialogs are currently implemented & along with help from the mailing list I succeeded. (Note on terminology – “Windows and dialogs in Second Life are implemented as LLFloater objects” which is why the word ‘floater’ appears a lot). The content & layout of the floater is defined in an xml file that goes in newview/skins/default/xui/en/floater_serial_monitor.xml (mine is called floater_serial_monitor, you obviously call yours what you want). This very simple example just creates an empty floater & the only point of interest is the layout="topleft" line which means that 0,0 will be in the top left of the floater rather than the default bottom left (OpenGL style). The implementation of the stuff in the floater goes in newview/llfloaterserialmonitor.h & newview/llfloaterserialmonitor.cpp. Of course you need to make the build system aware of these new files, on Linux by references to the relevant sections of newview/CMakeLists.txt. You then have to register your new floater in newview/llviewerfloaterreg.cpp by adding something like this, along with an include statement at the top of the file like #include 'llfloaterserialmonitor.h". Once you’ve done this, you’ll be able to show the dialog using showInstance. The wiki page for adding menu items hasn’t been updated since 2009 however is still mostly relevant. So if you want to do display your new dialog from the main menu bar that runs along the top of the viewer window, first add a menu item to an existing menu on the menu bar, or add your own menu to the menu bar & then add a menu item to that, by editing newview/skins/default/xui/en/menu_viewer.xml. This example adds a menu called ‘Serial’ that contains a single item called ‘Serial Monitor’. The function line refers to a method you add to newview/llviewermenu.cpp, first by adding a listener. Then by adding an event handler class that uses the showInstance method mentioned above. Part of my investigation into simultaneous presence in real & virtual environments involves streaming real world position, heading & orientation data into a modified Second Life viewer. 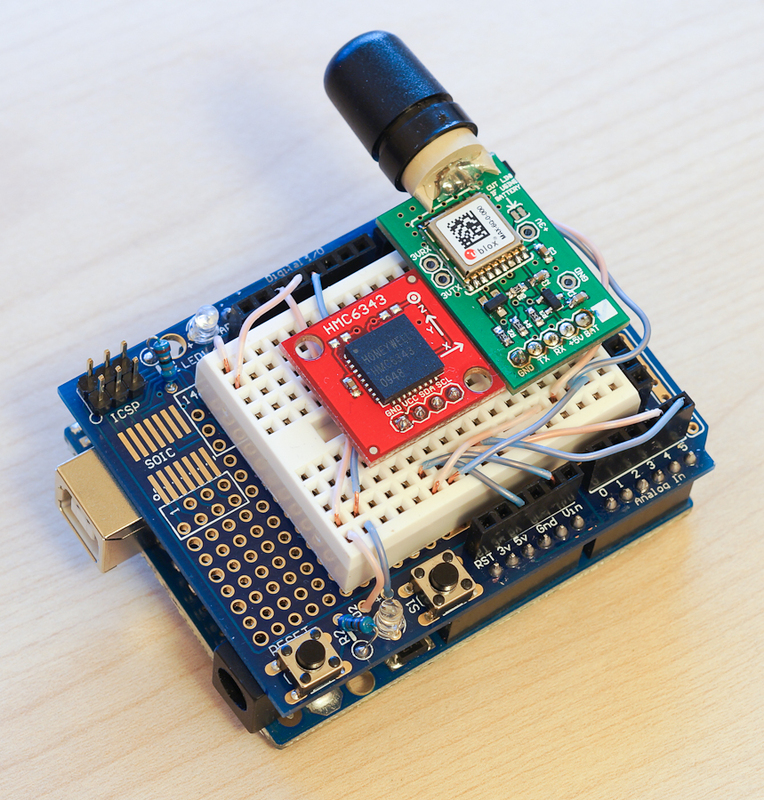 After much faffing about evaluation of different accelerometers, magnetometers & GPS receivers, as well as learning about GNSS & exciting concepts like magnetic declination, hard/soft iron offsets & tilt compensation, the result is an Arduino with an HMC6343 tilt-compensated magnetometer & a u-blox MAX-6 GPS receiver. Bitbucket link for the code/sketch! Pitch is the easiest of the three – you simply use an accelerometer. I tried both the ADXL335 with signal conditioned voltage outputs & the MMA8452 which uses I2C. These are both 3-axis accelerometers so can tell you roll, pitch & yaw all at the same time. They both did what I wanted, but the MMA8452 was easier to use as it didn’t involve experimenting to find out what values represented the rest/peak positions of each axis like the ADXL335 did. Heading (by which I mean a compass heading) also seems easy to begin with – you just use a 3-axis magnetometer (aka ‘digital compass’ or ‘e-compass’) & perform a calculation that uses the readings of the 2 axes that represent pitch & roll. I tried the HMC5883L but soon discovered that things get much more complicated if you aren’t holding the magnetometer flat – because the calculation doesn’t take the third axis into consideration, the heading becomes more useless the more you tilt it! To calculate a heading even when not held level (which is important for many applications) you need to integrate the reading from the third axis, which can be thought of as recording the magnetic field lost by the other two when tilted out of alignment, into the heading calculation. But to do this you need to know how the magnetometer is tilted – good thing we have a 3-axis accelerometer! There are a number of good tutorials/guides for this, including these two that I followed, however if you are lazy &/or scared by maths you can also buy ICs such as the HMC6343 that combine a 3-axis accelerometer with a 3-axis magnetometer & perform the tilt compensation algorithms onboard. Of course there must be a downside to this convenience & most obvious is the price. If you are a SparkFun sort of person the HMC6343 will set you back $149.95. To put that into perspective the ADXL335 is $24.95, the MMA8452 a paltry $9.95 & the HMC5883L just $14.95. The HMC6343 ‘3-Axis Compass with Algorithms’ is an I2C device so is easy to hook up (SDA to analog 4, SCL to analog 5 on an Arduino Uno) & interact with. The datasheet contains the protocol definition & communicating with it looks something like this (the example here changes the rate of measurements from the default of 5Hz to the fastest of 10Hz). HMC6343_ADDRESS is 0x19 & obviously you will also need to include Wire.h at the top of your sketch. The first Wire.write tells the device what command we want to run, in this example 0xF1 is the ‘Write to EEPROM’ command that expects 2 binary byte arguments. The first argument is which register we want to write to, in this example 0x05 is the address of ‘Operational Mode Register 2’ which stores the measurement speed. The second argument is the value that we actually want to write to this register & in this case 0x02 means that we want measurements at 10Hz. Simple enough, no? If you look through the sketch you’ll see this pattern repeated for setting the variation angle correcton, the Infinite Impulse Response filter & temporarily changing the orientation (so that you can mount the IC in different orientations without having to manually swap the axes, which is very handy). The HMC6343 also allows you to access just the accelerometer readings, separately from the tilt-compensated magnetometer readings, so this single IC gives me both the (tilt compensated) heading & the pitch. One more handy feature of the HMC6343 is the hard-iron offset calibration. Metallic stuff around the chip (wires, the GPS module, the Arduino, etc.) can affect the magnetic field detected by the magneto resistors & throw off the readings, so we can compensate for this using the built-in calibration mode. Read the datasheet to see how this works, but essentially all you have to do is send command 0x71, rotate the device in a certain manner, then send command 0x7E. In case you’re wondering what the difference between hard-iron offset & soft-iron offset is, the former is for things that won’t change during operation (eg the wires connecting the IC to the Arduino are always going to be there) whereas the latter refers to things that will change during operation (such as moving the IC around your lodestone collection). Hard-iron only need be calculated once, whereas soft-iron requires dynamic attention. My research into GNSS led me to the u-blox MAX-6 as my best option. Impressive specification, solid performance & compatibility with SBAS including EGNOS in Europe (Wikipedia page on GNSS augmentation/SBAS here). It turns out that it’s a popular GPS receiver amongst high-altitude ballooners (the kind of people who attach Arduinos & cameras to weather balloons & let them go) as it operates correctly at high altitudes which some receivers evidently don’t. So after some discussion on the #highaltitude channel on freenode I ended up ordering a MAX-6 with the appropriate level conversion to work with an Arduino (the MAX-6 uses 3v logic, whereas the Arduino uses 5v, so conversion is required so as not to fry the module). I ordered it from here & based my sketch on the example code here. The MAX-6 is a serial device (no convenient I2C here) so interfacing with an Arduino is slightly different. The wiki page linked above recommends not using Software Serial, however as I also want to run the HMC6343 on the same Arduino I have no choice – so far I haven’t experienced any trouble with it. The protocol specification for the MAX-6 is substantially longer & the messages much more complex than the HMC6343. If you want to have a go at assembling the messages by hand you can do so by reading the 220+ page document & I actually had some success with this, however then discovered that the easier way is to use the u-center software which allows you to configure the receiver from Windows using tickboxes & menus then see/copy the messages from the relevant console window to paste into your sketch. The u-center software worked fine for me in a Windows 7 VM running on a Linux host, using pins 0 & 1 on an Arduino to connect the receiver directly to the USB connection via the Arduino’s UART. The first thing we do is create an array of type unit8_t that contains the message itself. The final 2 hex values are the checksum & the call to calculateUBXChecksum on line 2 calculates these values & substitutes them into the array. To send the message we use the sendUBX method & keep on trying until the receiver sends us a confirmation. Again you will see this pattern repeated a number of times in the sketch, to set the dynamic platform model, enable SBAS using EGNOS, disable all the messages that I don’t want & enable the ones that I do want. Getting data from the HMC6343 is a simple case of sending the correct command (0x50), requesting the correct number of bytes & then reading them into sensible variables (heading, pitch, etc.). It’s not hard to parse it yourself, but why go to the effort when there are libraries like TinyGPS that can do it for you? So what was the point of all this again? Well, my modified Second Life client listens on the serial port using Boost.Asio, receives these messages & then uses then to control avatar & camera – more on this soon!